One of my favorite food smells is that of chocolate chip cookies baking in the oven (Yum!!!). Fresh baked cookies and other baked items are one of the things I miss when I go camping since my camper doesn't have an oven in it. 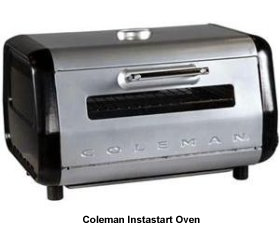 Coleman has solved that problem with its Instastart Camp Oven. Things like fresh baked cookies, cakes, pies, and breads that are difficult to make with a traditional camp stove, grill or open fire are now possible with the Instastart oven. It's large enough to hold a 9"x13" baking pan and runs on propane so there's no worry if you don't have electricity at your campsite. Plus there's a viewing window so the progress of the items inside can be monitored. The one negative thing people have said about the oven is that it can be tricky to regulate the temperature because although there is a thermometer on the top of the stove to let you know what the temperature is inside, it doesn't have a thermostat. This means the user has to fiddle with the temperature knob until the correct temperature is reached which takes a few minutes. But, once the oven gets to the desired temperature it maintains it pretty well. The price is pretty reasonable too. At the time I'm writing this it's available on the Coleman website for a little under $100 and available at Amazon for $72.99 with free super saver shipping . That's a less than I paid for my Weber portable grill earlier this year.